Redeem your printable coupon or online promotion code right now at Crabtree & Evelyn stores in the U.S. or online. You have a chance to take an additional 10% off selected floral collections! To receive the offer online: sign into your account and enter the promotion code PRFLORALS at checkout. 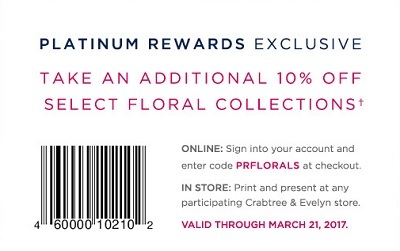 To receive the offer in-store: print and present the coupon at any participating U.S. Crabtree & Evelyn store. Hurry up, offer ends today! Source of the information is Crabtree & Evelyn. More information available at any U.S. Crabtree & Evelyn store or Crabtree & Evelyn online. (total: 316)G.H. Bass & Co.